Six days of dry, sunny days in the northern rainforest can throw off my internal clock. Experiencing it dog sitting at a friend’s beach house compounds the problem. Here at water’s edge, I feel my sleep patterns slipping as we stay up with the daylight of each lengthening day., seduced by how it deepens shadows on surrounding mountains while appearing to set alight their remaining snow. (My word selection is also affected). Aki and her dog buddy seem unaffected. Yesterday, or was it the day before, we took them up a forest trail, crossing several small streams with the careful asymmetry of a Japanese garden, until reaching a pocket meadow dotted with stunted pines. For the dogs we could have been on any trail frequented by other dogs that leave behind signature smells. 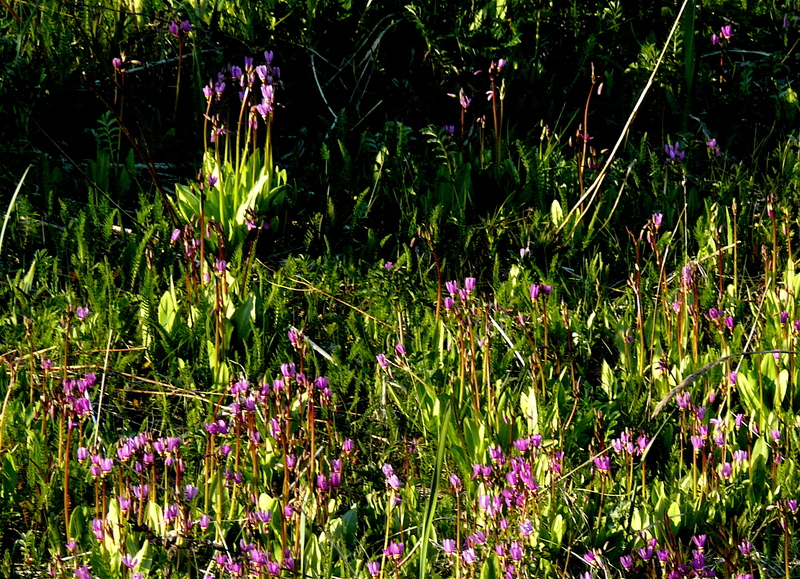 I hoped to find the magenta flowers of a Shooting Star. Even this long stretch of good weather couldn’t force that miracle in May. Last evening, Memorial Day in the USA, we found a patch of the flowers in full bloom in a beachside meadow. We had ridden there on bicycles, Aki riding in a handlebar basket. While we ate a late picnic dinner at meadow’s edge the air filled with geese and gulls disturbed by others there to enjoy the convergence of sun, warmth, and the holiday that marks the beginning of our summer. 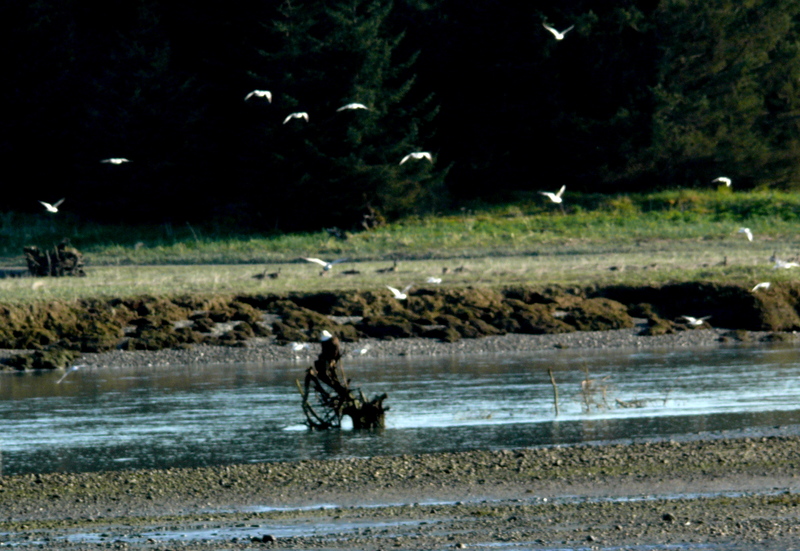 A bald eagle, securely placed mid-river on a protruding drift log root, appeared to ignore the cloud of gleaming white gulls and scattering Canada Geese. 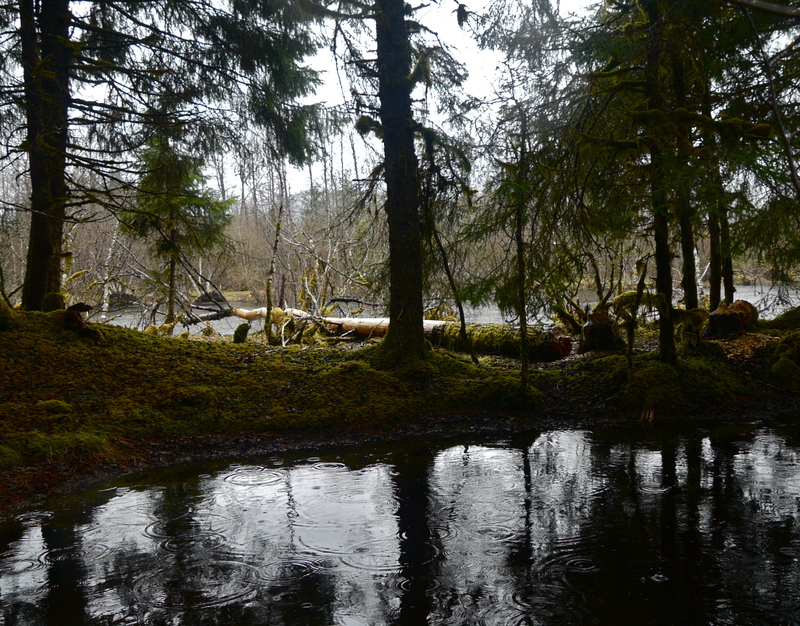 This entry was posted in Aki, Dan Branch, Juneau, Nature, Southeast Alaska on May 28, 2013 by Dan Branch. Except for the odd eagle, bear or deer, we see few animal stars on Chicken Ridge. (There was that Bohemian Waxwing caught eating fermenting berries in our diminutive Mt. Ash tree—yellow accents brighter than red berries partially covered with fresh snow.) Aki and I must walk to places that draw the marmot, whale, or sea ducks. This morning the little poodle sleeps in a beach house out–the-road where we are house sitting. 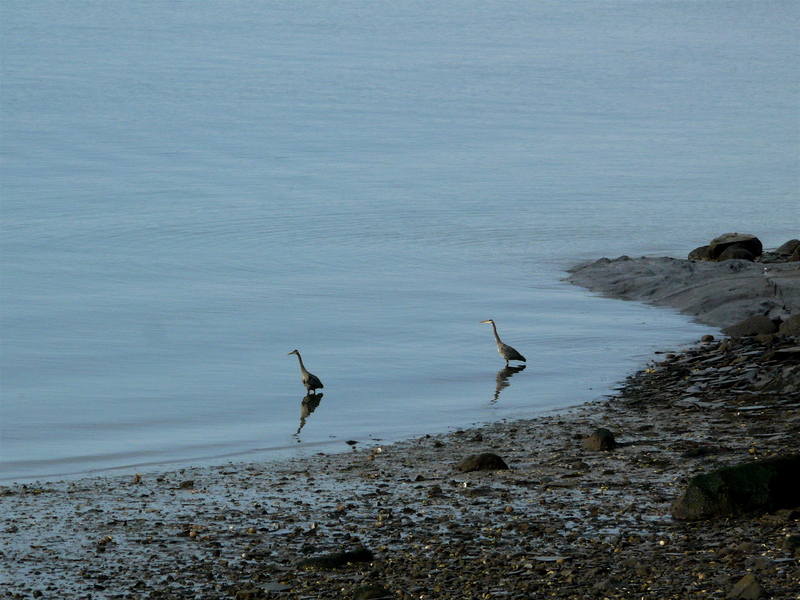 Two heron fish on the beach, close enough for watching over morning coffee. One arrives first, gliding on its great wide wings, hovering for an instant, then planting feet without a splash in shallow waters. He forms a statute of patience, gray body almost disappearing against gray water until morning light strikes the white head feathers. Like Dr. Who’s deadly statutes, the heron changes positions each time I look away but never attempts a catch of fish. The second heron, gliding to a stop 10 feet away from the first, has better luck. In seconds he moves his beak within inches of the water, strikes down until head is submerged , rises up then whips rapidly from side to side. This happens many times while the first, apparently myopic heron remains upright. 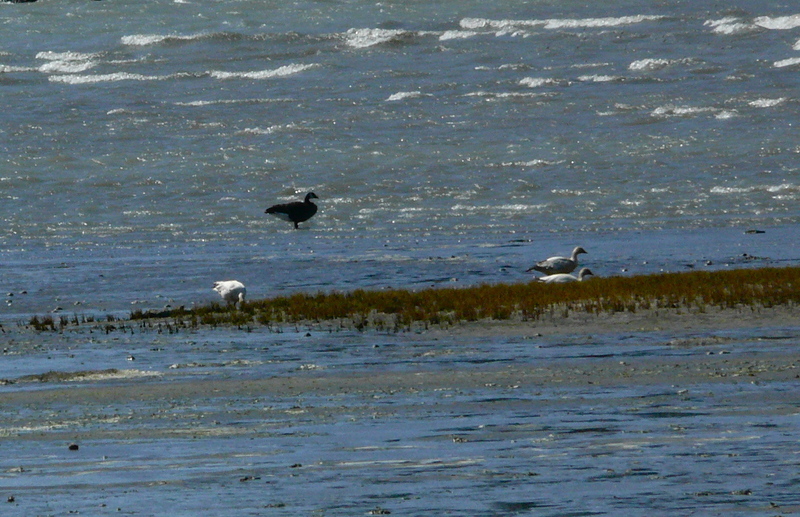 The second heron’s success attracts local scavengers: gulls and an aggressive crow. 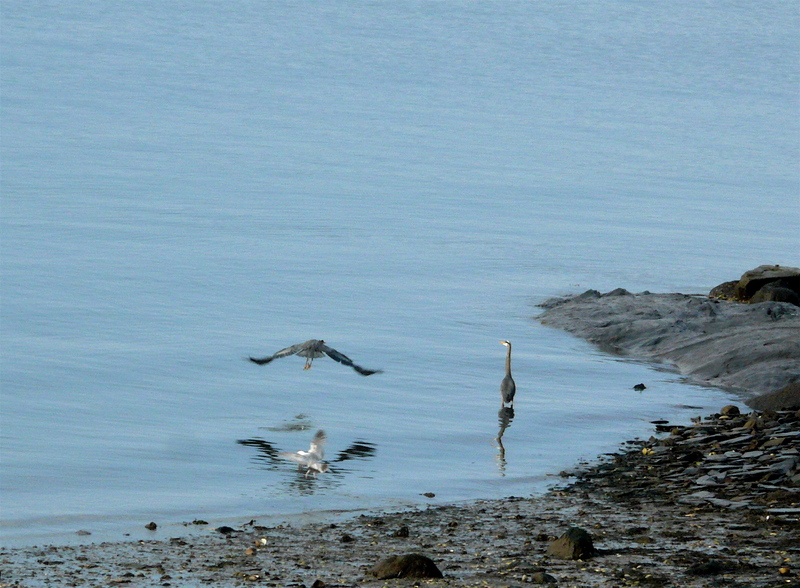 In minutes both herons move off down the beach. 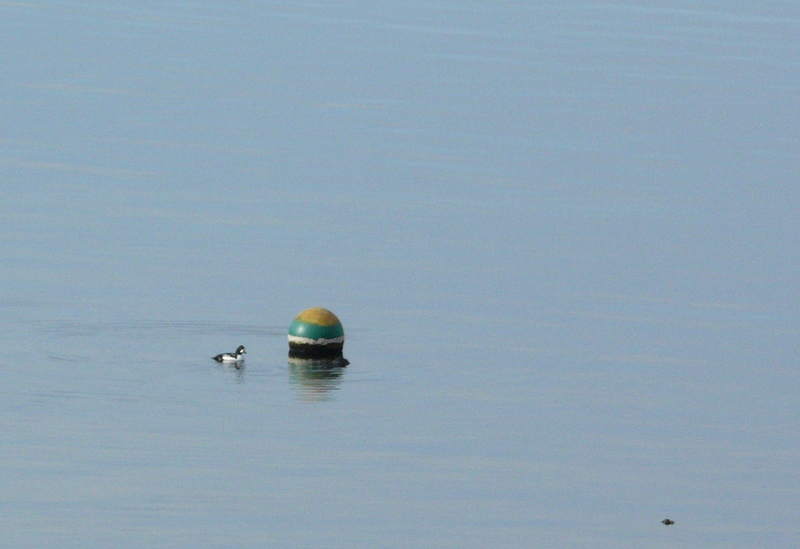 Now, just offshore a lone Barrow Golden Eye duck swims about the side of a brightly stripped anchor buoy. The bird acts like its sheltering in the lee of the buoy during a gale but the sea is flat calm. With more knowledge of people than animals I want to assign a human justification for the things I watched this morning. Is the duck smitten with the pretty buoy? Did heron number 1 become angry when number 2 arrived uninvited and like a rude guest nosily catch fish while a hungry number 1 pretends to look away? This entry was posted in Aki, Dan Branch, Juneau, Nature, Southeast Alaska on May 24, 2013 by Dan Branch. I’ve dreamed of seeing Snow Geese in flight ever since we lived in Southwestern Alaska. People from coastal villages told me how the big birds moved south in great flocks each October, stopping in remote areas of the Bering Sea Coast, places less accessible to us than Paris that time of year. We had swans and quirky Sand Hill Cranes, a myriad of other waterfall, but no cloud of Snow Geese ever darkened the Bethel sky in October. Today I barely noticed three of them feeding under the apparent guard of a resident Canada Goose. This fulfillment of an old dream came on a day dominated by birds and sunshine in Spring. 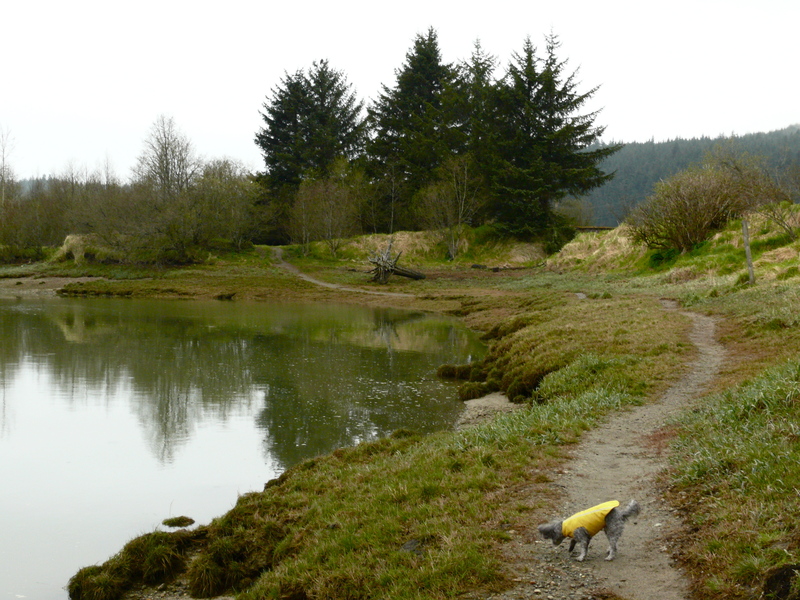 Aki and I returned to the Riverine forest trail, now dry after rain washed away the last of winter snow. 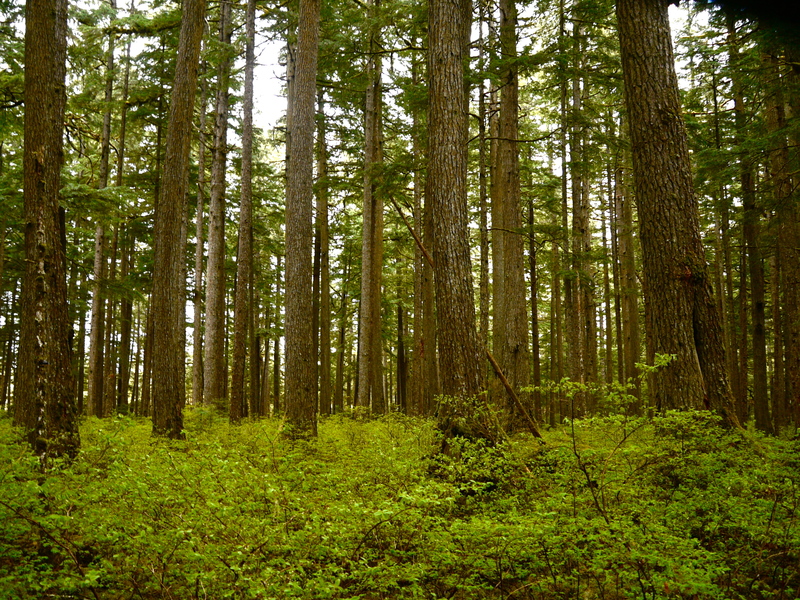 Nesting bird song from invisible singers dominates the old growth when we enter the forest. Following Aki over to the forest edge I spot two Belted Kingfishers in noisy battle over the river. We move on after one drives the other off. Deeper in the woods a Red Breasted Sapsucker (woodpecker) works the remnant of a large spruce than eyes us as we pass. There’s a heavy wind blowing off Lynn Canal but we don’t feel it until reaching the riverside meadow. I have to take it full on but wise little Aki plots a path along brush and trees that offer her relief from the wind. 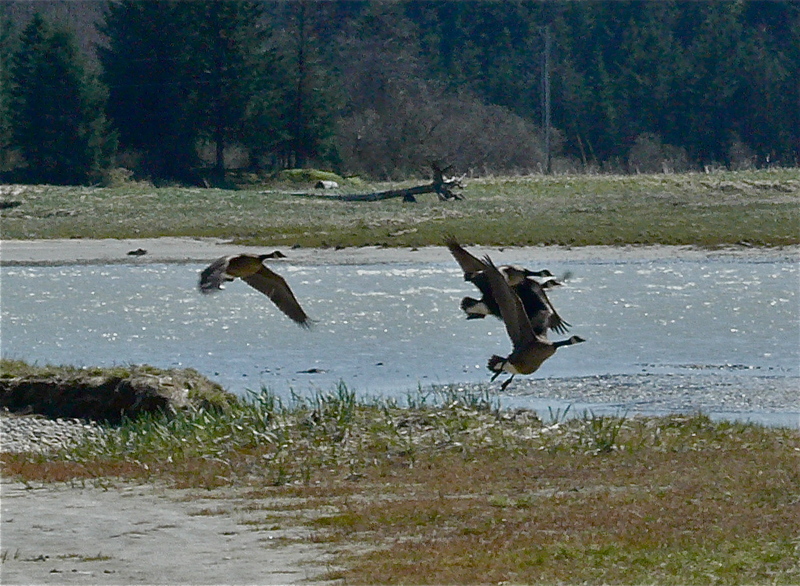 White-capped waves reach to a line of sand bars behind which the resident Canada Geese feed in calm water. More geese feed on river islands growing with the retreating tide including my three Snow Geese. While the resident birds sleep in the sun the Snow Geese hunt hard for feed. These must be stragglers. We heard reports of the Snow Geese migration reaching Fairbanks last month. Maybe they wait for the south wind to help them north. This entry was posted in Aki, Juneau, Nature, Southeast Alaska on May 21, 2013 by Dan Branch. Aki and I picked this trail through the old growth today because heavy rain can’t impose its full will on us in here. 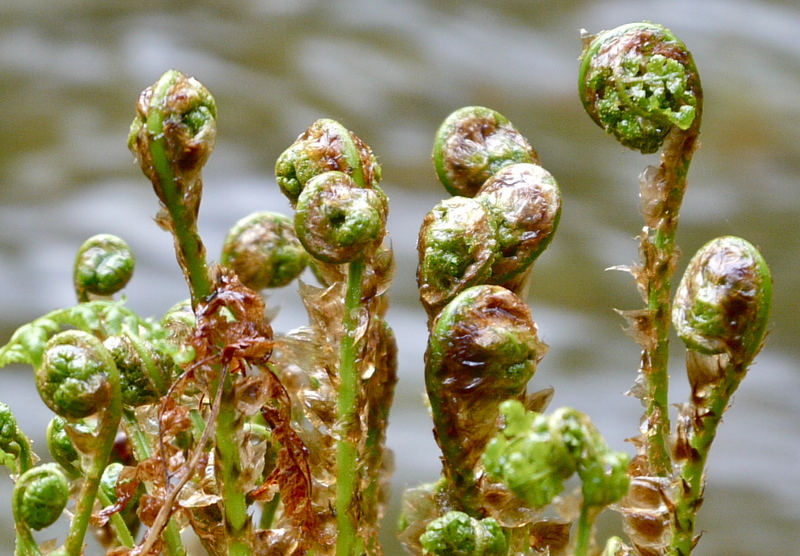 We walked over frozen ground our last visit, now softened by rain and what passes for the warmth of spring. Then only the winter evergreens and foolhardy skunk cabbage showed much color. Today blueberry and huckleberry bushes cover the understory with a canopy, thick and undulating enough to mimic in green an unsettled sea. With the swollen creek’s song almost masking those of nesting birds I imagine launching our double kayak from the trail to explore among the spruce islands but only after pulling the spray skirts tight to keep from being swamped with fresh leaves. The berry bushes’ exuberance doesn’t spell the end of winter. They have a history of misjudging the seasons. 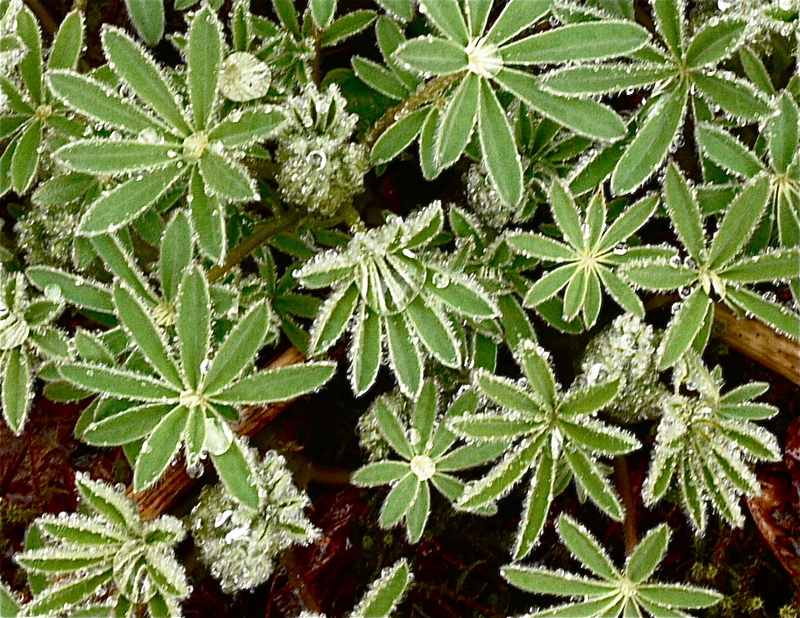 I hold out for sign from the forest elders, devil’s club and spruce, before packing away the ice cleats; finding it in the cabbage like growths forming at the tip of each devil’s club stalk, the swelling needle buds that will soon form dark green accents at on the edges of every spruce twig and branch. 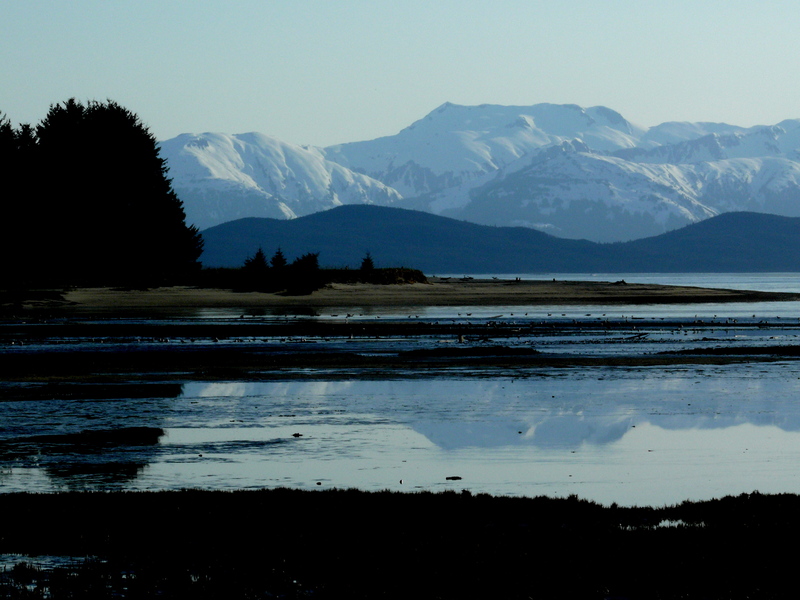 This entry was posted in Aki, Juneau, Nature, Southeast Alaska on May 18, 2013 by Dan Branch. It’s as if this heavy rain washed all beauty and light from the moraine. Without their displays of yellow green leaves trail side alders and willows look drained of life. Willing to put up with a soaking, Aki and I press on to the river finding only gray green water flooding over its banks and a circus of swallows hunting newly hatched mosquitos. Tiny islands of summer do appear on the next trail taken: sparkles of rain water trapped in the upturned leaves of lupines, garish red strings of alder pollen blossoms, an American Robin, optimistic songs of wren and thrust. Needing a richer display I lead Aki into a tiny spruce forest covered with thick yellow green moss. The little dog perks up, dashing over the moss softened ground in search of beaver sign. I see it first — a large cotton wood tree first felled then striped of bark by beaver teeth to reveal the tree’s clean white flesh. In this lush island’s heart a car from the 1930’s rusts away, paintless except for one oval shaped headlight stubborn enough to retain a coat of green. Nearby the feathers and bones of a Canada Geese, stripped of flesh by ravens shine with rain. 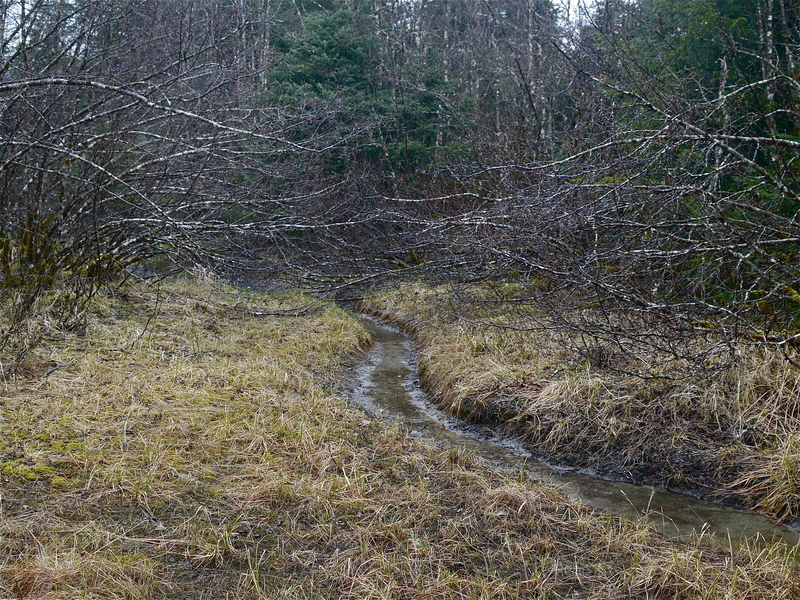 This entry was posted in Aki, Beavers, glacier moraine, Juneau, Nature, Southeast Alaska on May 14, 2013 by Dan Branch. Aki and I are the only ones this wetland today not looking for safety. The birds, transients or locals, must use location, numbers or speed to avoid their predators. Only the Lesser Scaups sleep in peace on a river made wide by a flooding tide. 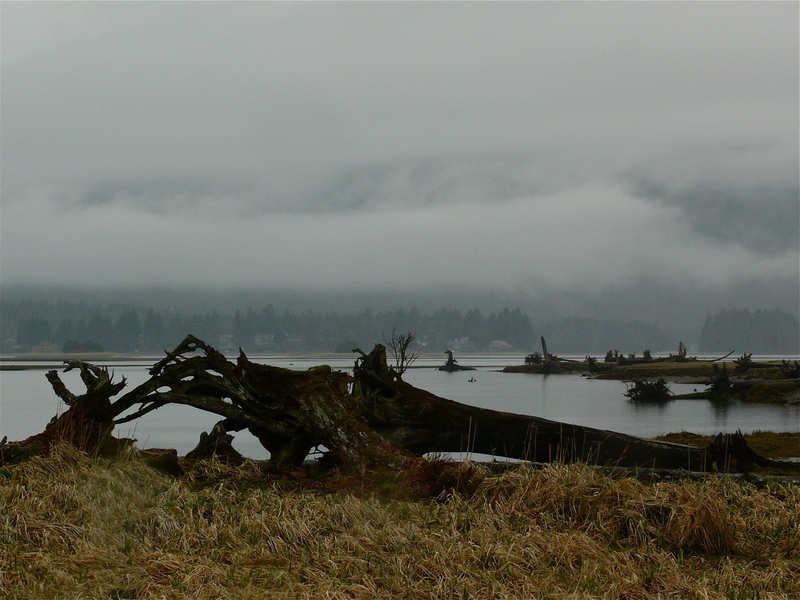 A low marine layer blocks any views of the glacier or mountains and persistent rain discourages any skyward views. 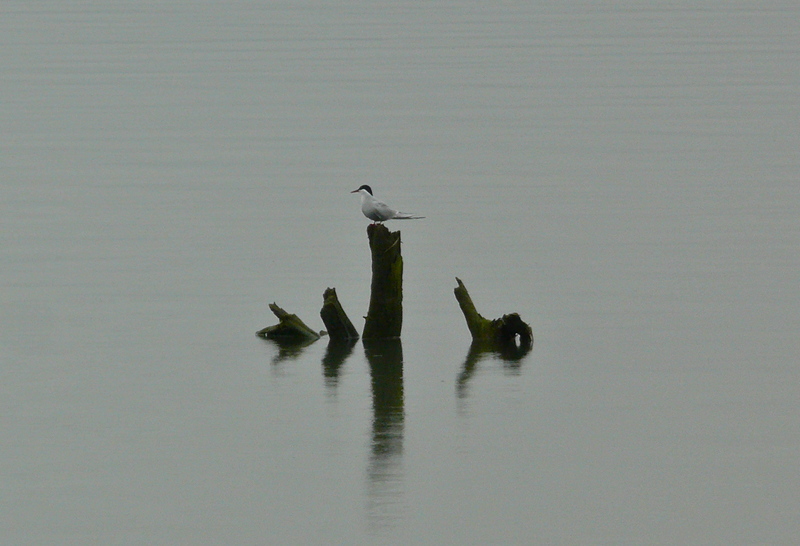 If not forced downward I would have missed this solitary tern resting just off shore on vertical shaft of driftwood, not seen its curving black cap over white head and grey body. Until last year terns bred on a sand bar near the glacier before leading their young on one of their South American migration. Then ravens raided their nests and the sudden bursting of a glacier dam flooded them out. No chicks made the trip south last fall. Beyond the tern, sea lions splash and make noises that I can almost duplicate by forming the word “are” where my mouth and throat connect. Behind us 100 Canada Geese, driven off the protection of their offshore sand bar fly deeper into the meadow to reform and designate members to watch for danger. Leaving the tern we walk through a ghost forest of weathered spruce and hemlock corpses, all carried from their place of growth by storm tides then striped of branches and bark on their journey to this riverside meadow. The trail ends at the dead forest’s far edge where flooding waters discomfort a clutch of shorebirds until they burst up to form a cloud that expands and contracts as they fly a serpentine pattern over water then around Aki and I. I love the way they flash their brown backs then white bellies in unison, injecting the intensity of mountain snow in sunlight on this subtle gray day. 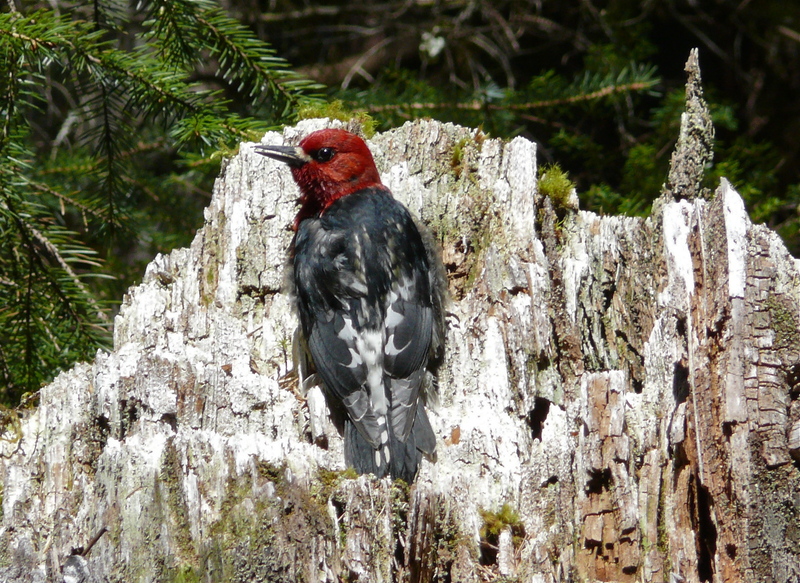 This entry was posted in Aki, Juneau, Nature, Southeast Alaska on May 11, 2013 by Dan Branch. 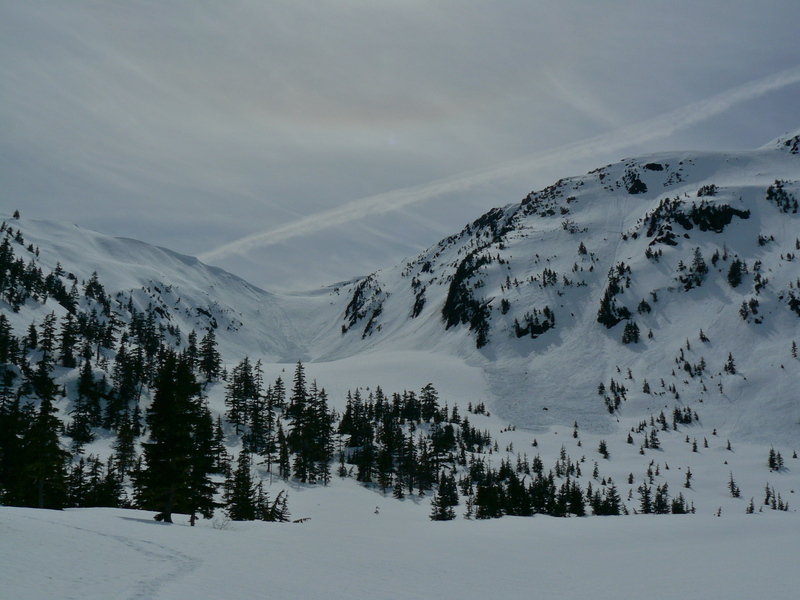 Aki and I return to the mountains, this time with a reinforcement, with plans to climb to Cropley Lake. The Scots would call it a corrie; in France its a cirque— a pothole lake left by the retreating the glacier after carving out the surrounding mountain amphitheater. 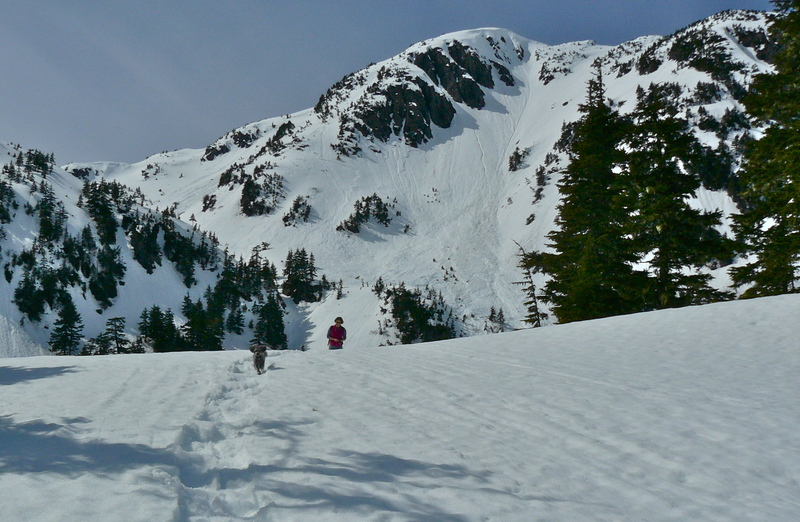 It’s a steep climb up, made more difficult today by the soft wet snow on which we snow shoe. The series of bowls and meadows we cross offer great sport for Aki as she dashes between myself and her other housemate. As I climb a particularly steep bowl, the little dog stands by my partner as she exchanges text messages with our traveling child. They stand in a pocket of reception in mountains without cell coverage until I reach Aki’s limit of 50 meters of separation. She charges up the mountain snow until reaching my side then flies down to her other human. Up and down she goes as we move toward the lake. A scattering of hard done spruce trees occupy the next meadow we cross. What first must have seemed like a perfect place for sprucelings to grow (easy light and abundant water) the meadow offered paradise for the young trees until they grew tall enough to attract attention from the wind and blowing snow. Those forces first shaped the trees into tough twisted survivors, then stripped them of green and eventually life. The old dead ones only offer tall perches for hunting birds and signposts for us. 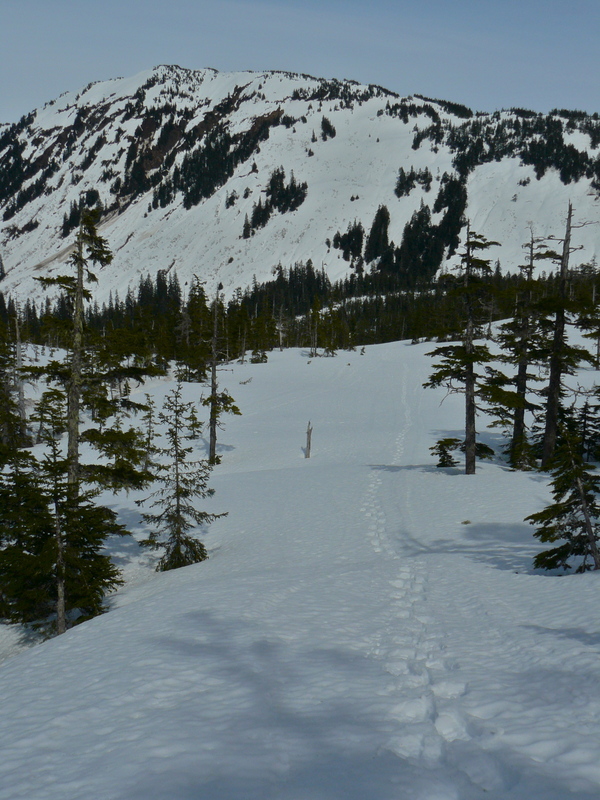 We find the lake still covered deep snow while avalanche tracks mark the surrounding mountain bowls. Above one the sun shines surrounded by a circular rainbow cut by vapor trails of passing jets. 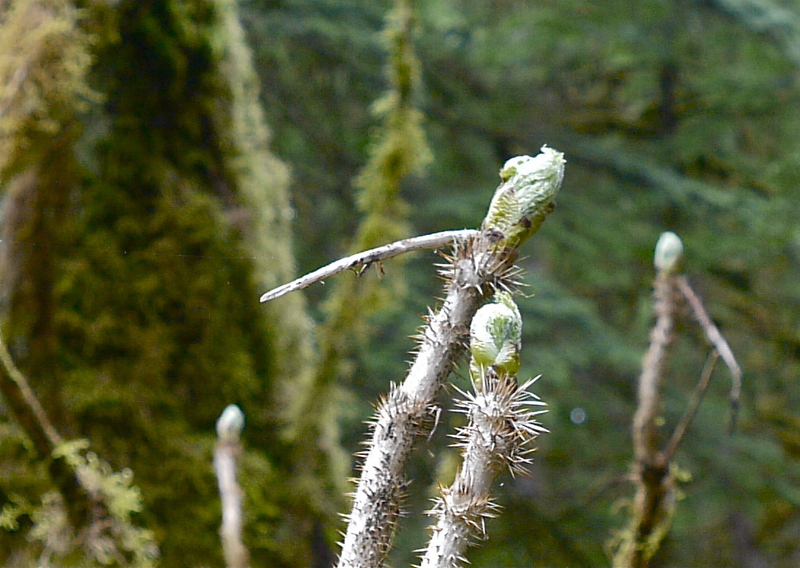 This entry was posted in Aki, Dan Branch, Juneau, Nature, Southeast Alaska on May 9, 2013 by Dan Branch.